Homo Sapiens – What have we become as a species? No longer programmed for survival of our species, we appear to be about to self-destruct. No longer do we prioritise protection of our young, our water, our food or shelter, as living species generally do. 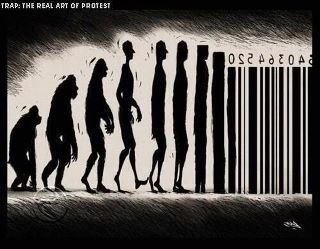 We have evolved into something else, which isn’t quite alive at all. We are no longer autonomous beings. We are products, or a commodities, which cannot think, but rather exist merely to make profit, remotely controlled by the very, very rich from some place we are unaware of. How much longer can be tolerate this mundane existence? Now is the time for change. But how? Occupy London calls for global solidarity to defend the Egyptian revolution. “We stand in solidarity with the global oppressed and and we call for an end to the actions of our government and others causing this oppression. We urge the UK government to withhold all support to the Egyptian military until power has been handed over to a civilian government and cease participating in arms deals in the region. Condemn the Egyptian military’s massacre at Maspero and all the military and police violence against peaceful protesters and demand impartial investigations into all these cases. Demand an end to military trials in Egypt and all intimidation of activists. Demand the immediate release of all political prisoners and detainees and for any trials to be before civilian courts with fair representation. Demand immediate lifting of state of emergency in place since 1981 and the guarantee of the right to protest and strike. Cameron, BAE, Rolls Royce, Qinetiq and all, you might be able to airbrush your propaganda but you can’t wash the blood off your hands. THE RIOTOUS SUMMER in England showed the anger of those without hope, with nothing left to risk. The official report disregarded events in Croydon, as reported by the Croydon Guardian. The official report lacks understanding. The Independent reports that the riots were considered by the Cabinet Office to be a “moment of madness”. The opportunity to “get free stuff” and the chance to get back at police were the other two big motivations, according to the report, “The August riots in England”, from the National Centre for Social Research. Researchers identified peer pressure, the sight of other people getting away with breaking the law, boredom and acting as part of a group instead of thinking for themselves as factors in nudging people to take part. THE REBELLIOUS AUTUMN began with The Occupy Protests, showing hope that there was to be an awakening to consciousness. The ignorance of the authorities is clear by their response to student protests in November which have been met by over-policing. Thousands of students and demonstrators marched through London to protest against tuition fees and the “privatisation” of the higher education systemon Wednesday, flanked by a huge police presence determined to ensure the violent scenes that erupted last year were not repeated. Fulfilling their promise of “total policing”, 4,000 officers took to the streets as Metropolitan police commanders blocked off large areas of the capital, bringing in dozens of mounted officers and blocking off roads with 10ft high barricades. 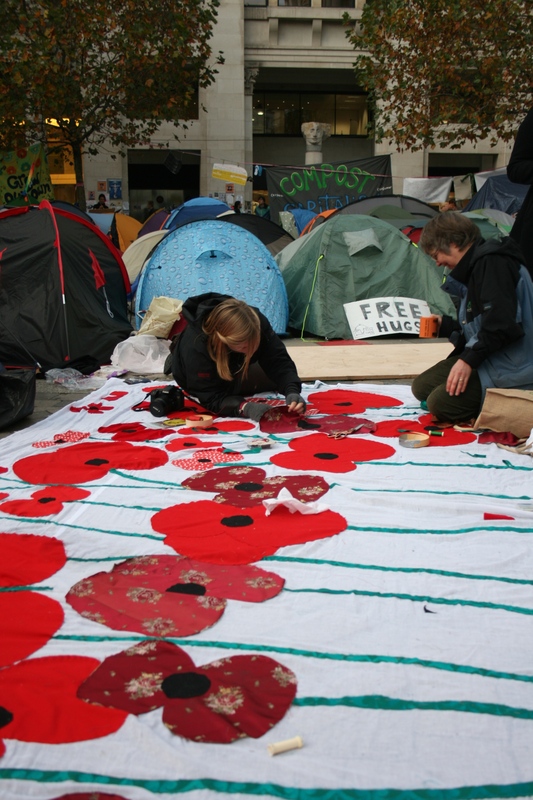 Protesters from the Occupy movement – which has been at St Paul’s Cathedral since mid-October – set up camp in Trafalgar Square with the aim of remaining until the mass strike of 30 November. They were quickly moved on by police, who also announced “additional conditions” for the march after it had begun. 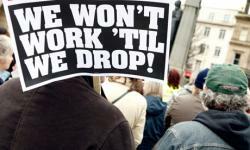 On November 30th 2011, three million public sector workers in Britain will strike over the government’s attacks on their pensions. The establishment needs to start listening. They cannot turn a blind eye, or act like ostriches. This coordinated strike action represents the biggest strike movement since the general strike in 1926. To all intents and purposes it will be a 24-hour public sector general strike. With a National Strike by 3 million trade union members against pension reforms expected on November 30th, is the government going to show they are listening? Or are they powerless like Italy and Greece, so it makes no difference? All seems to have become overshadowed by the Euro zone crisis has seen political leaders with no real power in any case, pushed from office. Are we now looking at the people reclaiming their rights patiently by Evolution, or bloody and violently by Revolution? Will it be mutation or mutiny? What discontent do we face this winter and beyond? I believe that we can bring about change, but only by standing together, side-by-side. Solidarity, like Socialism were words to be whispered ashamedly during the eighties but they now are meaningful and acceptable once again. We can bring about change by questioning the Banks’ motives, by exposing the secrecy, by questioning the politicians, the church and the media. We will not achieve change by division, but by solidarity. I believe The Labour Party is the only Party, which can challenge the status quo – the Conservative Party will not do this – The Liberal Democrats have shown no intention in challenging the neo-liberalist consensus. Socialist Labour must lead the way. Ed Miliband has described the Occupy London protest and others across the world as a ‘wake-up call’ and a symptom of a wider crisis caused by Eurozone turmoil, record unemployment, rising inflation and squeezed living standards.Miliband looked to use the actions of Occupy to reiterate the messages unveiled at the last Labour Party conference, where he vowed to rid the country of ‘irresponsible, predatory capitalism’. He added that politicians were in touch with the wealthy elite but were ‘badly out of touch with the reality facing the other 99 per cent’. Labour must now find its roots again. Labour politicians need to re-find their integrity and speak up and lead like Aneurin Bevan once did so admirably. We need modern day politicians to represent us, like he did and not to follow the neo-liberalists like the Pied Piper led the children to their own extinction. Now is the time for mankind to remember what it is to breathe, to live and to hope. First, to point out that the UK’s economic recovery started faltering before the Eurozone problems. This will require lots of graphs and easily accessible info in one place, and a sustained attempt to point this out to the media. Get the narrative wrong and we’ve effectively lost this entire generation. Sometimes I think that it might help to believe in some god, which could magically lead the way to socialism. But I know there is no magic in the sky, my belief is in people not gods. And it is we who can achieve a fairer society, a socialism in a greener world. If I say to you, “if I share, will you?” or “If I fight against unbridled capitalism and neo-liberalism, will you?”, do you see me as naïve, or do you too, still believe that the human species can determine its own destiny and join me? If that is so, that is my faith – humanity. Meacher Why is resistance coming from the street and not politics? This entry was posted in Economics, Foreign Affairs, Opinion, Topical News and tagged Euro crisis, London Riots, November 30, Occupy by Pamplemousse. Bookmark the permalink. I believe that what you have proposed would be a fantastic basis for a cross party movement – Labour, Greens, Unions, Co-Operatives and the politically dispossessed – to work together to make the step change required. An anti-coalition coalition. Perhaps a simple set of clear principles could be drawn up, and all left wing progressive groups be asked to sign up to them. Based on the 2010 election results, this movement would only have to gather a few million votes to succeed, if worked smartly. Labour would obviously be the bulk of this, but each area could be worked to give the best chance for a non coalition candidate to win. Also, 35% or about 15m people did not vote. A modest headway into this group would reap rewards for sure. Labour must lead the way. Other parties have a voice – the Greens for example, but only the Labour Party can oust this Coalition. A move to the Left will bring Socialist voters back to Labour, and we need thise who stayed at home to get out and vote. Green Party candidates opposing a Socialist Labour Party will let in the Tories just as Nick Clegg did last May. It is up to Labour to speak out, and up to Labour to lead. A socialist and green Labour Party with policies reflecting Think Left’s philosophies would be electable. With our current electoral syastem an enlarged Green Party could just let in the Tories. Labour must do one thing to get support from myself – a commitment to PR. My vote will not be lent to Labour unless this happens. If they commit to PR, and enact the ideas in your post I would happily lend my vote. Great article! I heartily sympathise! My caveat is that the Left’s support for the Labour Party cannot be unconditional; the Labour Party has to change and move towards becoming the kind of socialist and green party you describe so well. It could be argued that to lead evolutionary change, with legitimacy, amid rapid developments, Labour must first undergo a rapid evolutionary change within the party… and this change must include personnel, with some of the Blairite brigade stepping down from their front bench positions to make way for MPs who can think and articulate from a Centre & Left perspective. I understand and agree with you that the different sections of the Left should not compete directly against each other, and risk letting the Tories in. “Now is the time for mankind to remember what it is to breathe, to live and to hope.” Pam, it’s so lovely to see your words! You have the best kind of aspiration! btw, the illustration of the evolutionary path and the projected mutation into homo neoliberalis is superb and plain scary! Phil, I totally agree. Support is not unconditional. Labour should know that. Labour must remember its roots and be truly representative. The party was hijacked by the right and so many deserted. The process of changing that has begun, though appears very slow. I am impatient, and the world seems to be falling apart. Can we afford to be as slow to change as evolution? I think not, yet fear war. We need someone in the party to be brave speak up. It will be welcomed and a marvellous moment. Pam, I feel that your impatience is justified. I was hoping for more and better from Ed M in 2011, but he’s produced half-measures only. He sought to choose his shadow cabinet, but didn’t wield the power decisively; his leader’s speech was a mixed bag; his “squeezed middle” rhetoric attacks those at the bottom as much as those at the top (but he may be dropping this, to focus on the 1% v 99% theme? ); he’s been ambivalent on the public sector issues. The Left of the PLP may have to help him out by making their voice heard. There has to be major changes within the Labour Party if we want real change. That is why I joined the Labour Party recently. I have sat on the sidlines for too long and I believe that a lot of other people are doing the same thing. Change is coming. I agree Charlie. We are in the nightmare transition from one paradigm to another with the neoliberal ideologues trying to hang on to their mythology. My concern is for the new paradigm. This is an opportunity for a new sustainable green world or the dystopias of ‘Soylent Green’ and ‘The Handmaiden’s Tale’ with authoritarianism, fundamentalism and war. George W Bush is quoted as saying that the only way out of recession was to go to war. Lets hope austerity cuts to the military works against that option. It’s amazing that you should mention The Handmaids Tale, Sue. I just finished reading that. At the moment though War is probably inevitable. History denotes taht when politicians really screw up thats what they do. Cameron, Obama and Netanyahu should take time out and read On The Beach- Nevil Shute.